367,000. 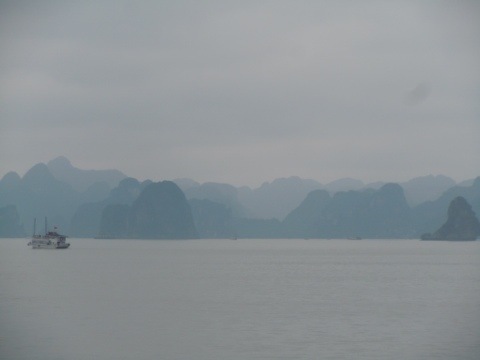 Nope, that’s not the number of islands in Ha Long Bay (there are 1969 islands in the 1553 square kilometers of the Bay). 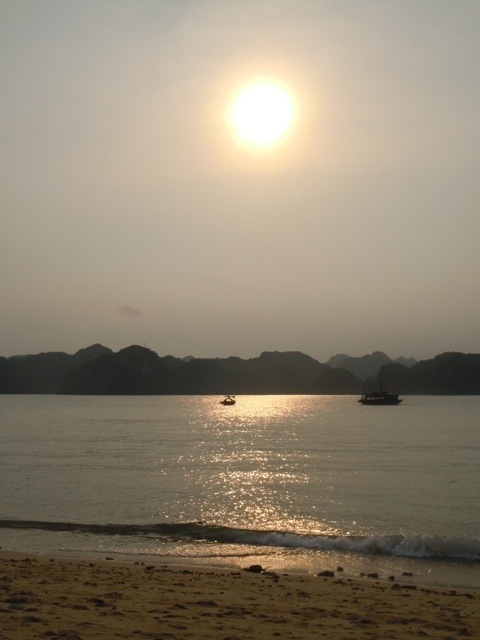 367,000 is the number of options, tour-wise, available to get you to Ha Long Bay. Maybe there aren’t that many, but it seems like it. Especially when there is (on the surface) very little difference between them. Here’s the gist of the matter: make a decision and be okay with it. If you look and debate for too long, you’ll drive yourself crazy. We spent hours agonizing on which option to choose; in the end, we booked with the Kangaroo Cafe, where we had lunch the first day in Hanoi. It was reasonably priced, the pictures looked good, it guaranteed small groups, had positive reviews and we liked the food at the restaurant. Done. Once the decision was made, we all breathed a sigh of relief. We met up with the four couples that would also be on the tour and loaded into the minibus. 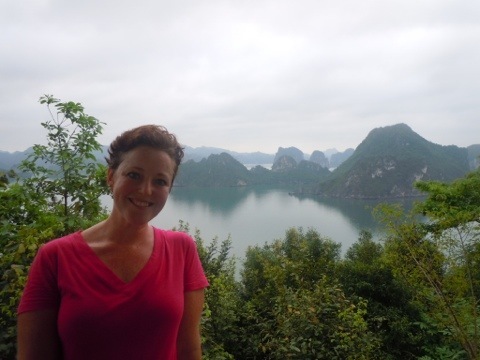 It takes approximately four hours to drive to Ha Long Bay, but it is a scenic one. Bumpy, but smoother and definitely more quiet (the horn is used more judiciously) than other mini-buses we’d been on. The country is overwhelmingly green, from the large swathes of rice paddies to the tree-covered mountains that rise on each side of us, the western ridge hovering closer than the abstract shapes to the east. Towns with brightly painted, tall slender houses temporarily obscure the view as we head north. It seems that the houses here are bigger than those down south, more substantial. Made of concrete, many are decorated with balconies, have towers or fancy roofs, or elaborate detailing such as tromp l’oeil, medallions or dragons. 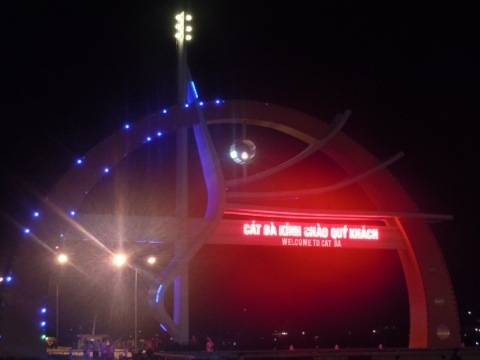 The roads are wider, too, which is comforting when the multitude of minibuses carrying tourists to and from Ha Long Bay rumble two, sometimes three, abreast. When we arrived on the bay’s northern shore, the dock was packed with visitors and the iconic junk boats that cruise the waterways. Except the boats looked different than I thought they would: they’re white. 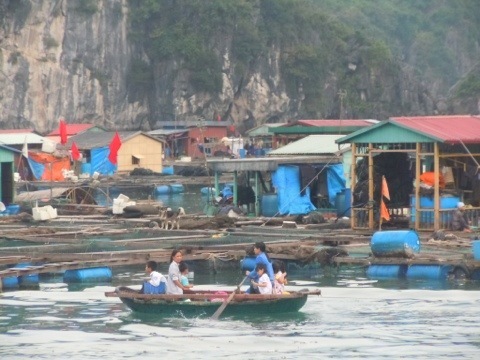 According to our guide, Mr. Tao, this is a recent edict from the government: they thought that if everyone painted the boats white, it would look nicer. 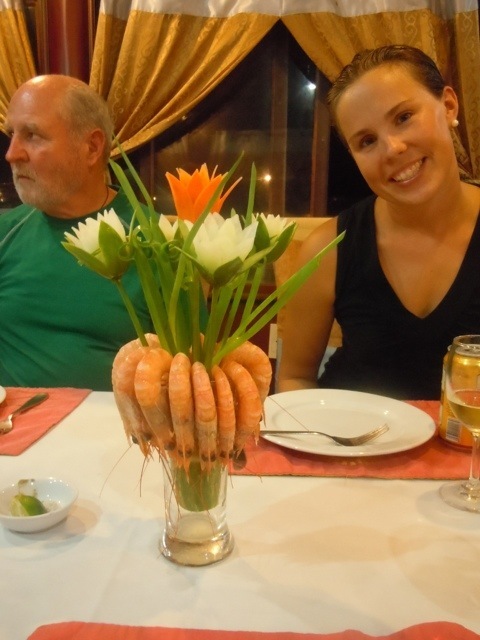 I’m not sure if the effect is exactly what they had in mind. 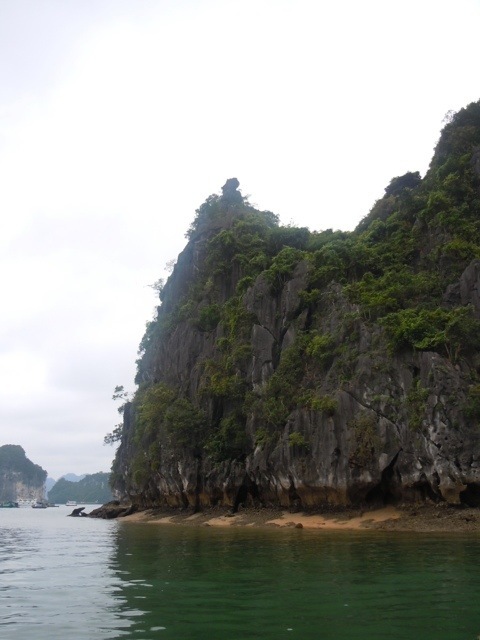 The limestone islands of Ha Long Bay, however, do not disappoint. It was overcast when we pulled up anchor, but the weather just added ambiance to the voyage. We glided between the islands, strewn in the Bay as if some giant had scattered them like pebbles. 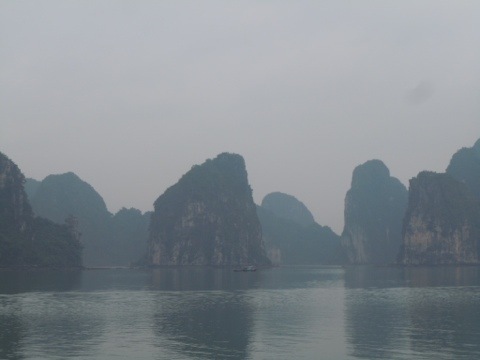 The haze lingered, lending a surreal quality to the landscape. Ignoring the multitude of other boats cruising in the same area, it was easy to imagine sea monsters and other fantastical creatures making a home here. 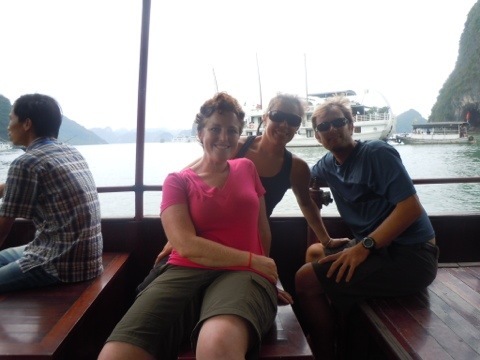 While in the Bay, we visited Hang Sung Sot (Surprise Cave), walked up to a lookout pagoda on the beach at Dao Ti Top for some spectacular views and enjoyed truly tasty meals on the ship. Our berth was really nice and waking up the next morning to views of the jutting cliffs was goose-bumpy. 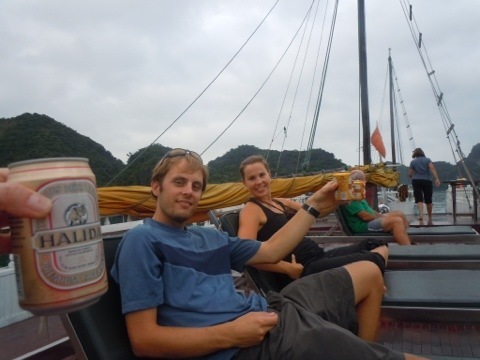 We’d opted for the two-night excursion, which meant one night on the boat and one night on Cat Ba Island. 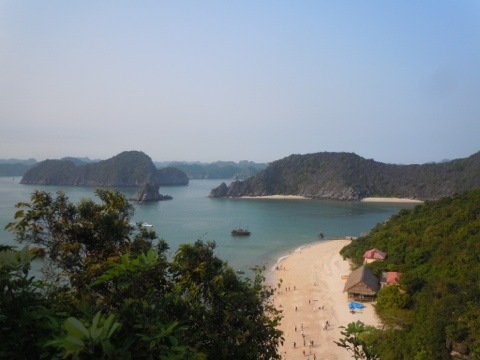 Cat Ba Island is the largest island in an archipelago located in the west of Ha Long Bay; the only town is Cat Ba town. After a nice lunch at the Green Mango, we took a boat over to Monkey Island for some beach time, a short clamber up the cliffs and sunset. On the way back to Cat Ba town, we rode through the floating village where an entire town lives, works and the children even attend school on the water. There’s really not that much going on in Cat Bat town, though you’d never know it from the dance music thumping from the club near our hotel. Apparently having three patrons is enough excuse to blast Lady GaGa enthusiastically enough that I could feel the vibrations through the floor. Personal note: ear plugs are light enough that there is no excuse for not including them in your packing list. 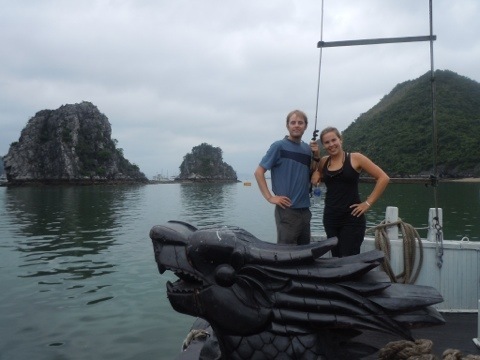 Overall, I enjoyed our excursion to Ha Long Bay. The limestone formations are spectacular and unlike anything I’ve ever seen. Anchored in a protected inlet that first night, I marveled at the massive islands that surrounded us. Waking up to the movement of the boat and peeking out the window from bed to see the mist wreathing the islands was something that I’ll never forget. However, the large slicks of fuel studded with trash and debris that floated through the Bay were awful; I couldn’t believe the amount of pollution in an area that is obviously a source of great pride (and revenue) for the country. It’s definitely a trip that I would recommend if you’re going to be in the area, but be prepared for the large amounts of people. 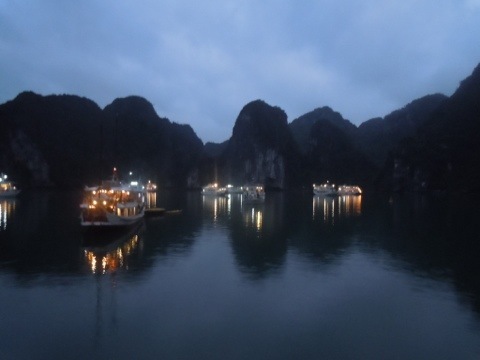 With Ha Long Bay named as one of the “Seven Natural Wonders of the World,” I know that the amount of people traveling to the area is going to continue to grow. Cheers! We’re on a boat! The mist is pervasive and only adds to the expansive sense of the place. 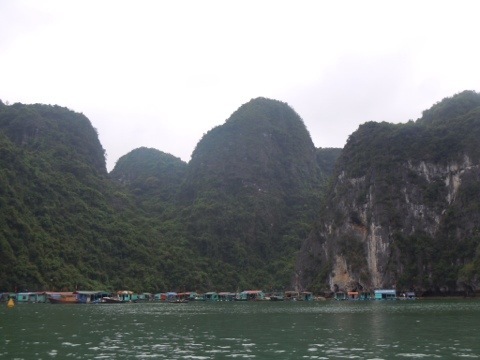 Tags: Cat Ba, cave, cruise, Ha Long Bay, junk boat, Kangaroo Cafe. Bookmark the permalink.